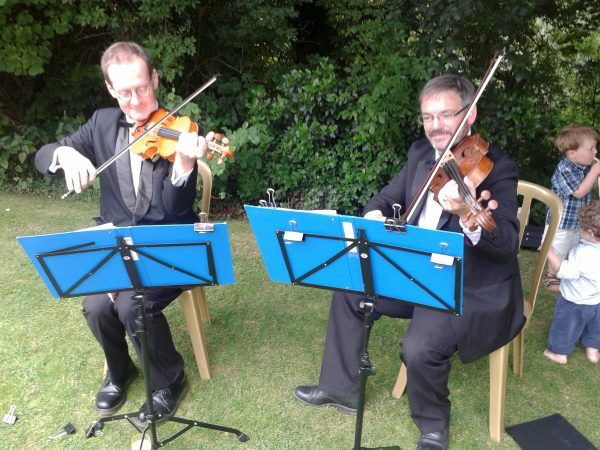 On a Saturday in May, our string duo (for violin and viola) played for a lovely wedding at the picturesque church of All Saints in Nash, Buckinghamshire. It was one of those occasions where the pre-ceremony music really helped in settling the nerves of the groom and relaxing the guests before the arrival of the bride. In such situations, playing familiar,¬†catchy pieces (such as Christina Perri’s ‘A Thousand Years’) can really create the perfect atmosphere, making the beginning of the ceremony even more special. The bridal entrance music was the¬†much-loved Canon in D by Pachelbel, a piece of music perfectly appropriate as music to the bridal entrance. The ceremony was a wonderful celebration of a very happy couple and during the signing of the register, we played Elton John‚Äôs ‚ÄòCan You Feel the Love Tonight‚Äô from the musical ‚ÄòThe Lion King‚Äô. Later on, the bridal party made their way to The Bell Inn in the village of Beachampton, again in Buckinghamshire, and here we played a selection of rock and pop classics for the string duo (you can view our entire string duo playlist here).